Home / UncategorizedA magical master bedroom!! 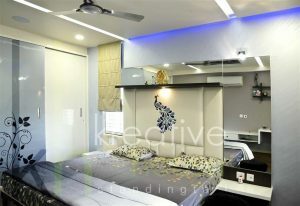 The master bedroom is a cool and elegant combination of grey and white with trendy lighting and a convenient floating shelf highlighted by an eye-catching accessory. A special spotlight under the shelf illuminates an attractive peacock mural, which is complemented by the floral art on the wardrobe and the design of the bedlinen. Discreet blinds can be pulled up to let in plenty of natural light and fresh air. ← Tips for Designing the Perfect Home Office!! HOW TO RAIN PROOF YOUR HOUSE THIS MONSOON! !